Touch up your recording with just only a few clicks by using filmora scrn. Screen recording sessions in Camtasia 9 can be educational and fun at the same time, but if you'd like to make your videos more informative and entertaining you should consider learning how to draw on the videos you are creating. Annotations can serve a whole spectrum of purposes from leaving funny comments for the viewers to adding vital information about the topic you are covering. There are two ways you can draw on the footage you are producing, you can either do it while you are recording or after your video recording session is over. The first option can be a bit complicated if you are not entirely familiar with the software because you might end up looking for the shapes or a text box you want to add to your video a bit too long. We gathered all the information you might need if you want to enrich your videos with cool looking drawings. Drawing in Camtasia 9 while recording is astoundingly easy since it requires just a few adjustments. Before you start your recording session with the Camtasia Windows Recorder, select Tools > Recording Toolbar > Effects Toolbar, and then hit Record. Once the recording session is on the way you will see the Effects Toolbar on the Recorder panel. Click on the ScreenDraw button and the several different options will appear on the toolbar. You can draw arrows, circles, rectangles or eclipses, while you can also choose the pen tool if you would like to write or draw something. The ScreenDraw feature enables you to select the color of your drawings, while you can also set the size of the visual content you are adding by adjusting the width option. If for some reason you didn't like your illustration, press ctrl+z to undo the last action. All drawings created during the recording session are burned into the video and they can not be changed or removed after the session is over. Recording and drawing simultaneously can put a certain amount of pressure on you because there is almost no room for errors. Unless you are broadcasting your stream live, a much better option is to add all the annotations and drawings during the post production. Once you've imported the video in the Camtasia 9 Video Editor you will see the editor's menu that offers options like Transitions, Animation or Voice Narration. Clicking on the Annotations tab will enable you to access sub-tabs and select the category you want to use. Double clicking the option you'd like to utilize will automatically add the drawing to the same position at which the Playhead is placed, while you can also drag the annotation to the desired location. There are several annotation categories such as Callouts, Arrows and Lines, Shapes and Blur & Highlight. Callouts options enable the users to create speech bubbles, choose from a number of styles like Abstract or Bold or to add plain text annotations to an image. Without much effort, users can blur or pixelate portions of the images they don't want others to see, while Interactive Hotspot feature provides interactivity that allows you to include URLs into the MP4 video. Learning how to draw on screen in Camtasia 9 may take a little bit of time, but the results you will be able to achieve once you master this editing technique are worth the effort. Camtasia 9 may be a great screen capturing tool, but it is far from perfect. Alternative software like Filmora Scrn that is capable of producing stunning visual content might be a better choice for the users who are looking for a powerful and cost-effective screen recording software. If you would like to draw on the videos you captured with Filmora Scrn you can easily do so with just a few simple steps. First, you need to import the video clips you would like to edit into the Filmora Scrn Video Editor via the Import Media option. Once the footage you want to edit is in the Video Editor, drag it and drop it on the timeline. 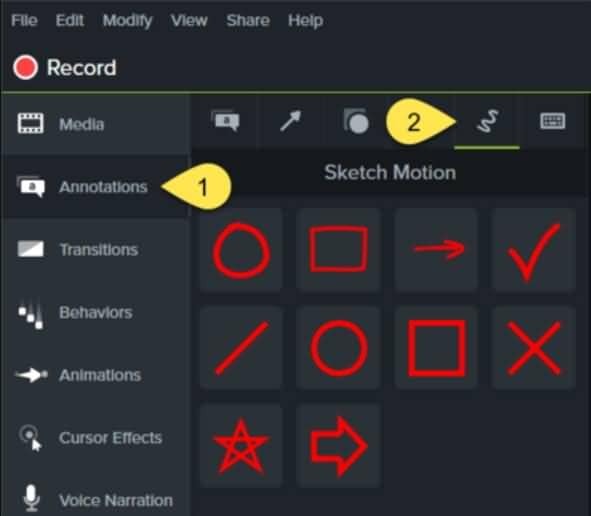 Clicking on the annotations tab located next to the Media feature in the upper left corner of the editor will open a sub-menu that offers a wide range of different annotation types. You can choose between plain text boxes, lines, arrows and a vast number of different shapes. Drag and drop the desired effect onto the track below the video clip and adjust the duration of the effect by stretching it. The timeline enables you to see the duration of the annotation you added and if you'd like to remove the effect right-click on the effect you want to remove and select delete. Filmora Scrn is reliable screen capturing software that allows you to add annotations that will improve the quality of your videos.